Webster MBA students Marilynn Dawson, Kent Sheffield and Morris Fordham prevailed over thousands of competitors. Three Webster University MBA students took a couple of days off from studies last weekend, but they were hardly taking a break. The students had qualified for a grueling 30-hour business simulation competition and emerged as champions, beating more than 2,000 competitors from 18 countries in the Capsim Spring Challenge. 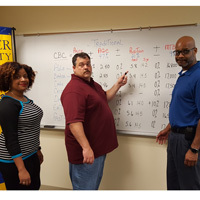 Marilynn Dawson, Morris Fordham and Kent Sheffield of Webster University, who are master's of business administration candidates at Webster's Jacksonville, Florida, campus location, are students in the Strategy & Competition class. Through an initial round of competition they qualified for last week's international Capsim Challenge finals, a biannual international competition that pits over 2,000 Capsim alumni in head-to-head competition. Among the countries represented were Australia, Brazil, Denmark, Egypt, Israel, Russia, Thailand and the United Arab Emirates. In Capsim’s online business simulation, students obtain real hands-on-learning experience that measures their business acumen using real-world business scenarios that greatly enhance the classroom experience. The finals competition pitted the top six teams against each other. Just making the finals was extremely prestigious, but the win truly reflects these students' excellence and the quality of Webster University’s MBA program. Webster University's master's of business administration program is designed for professionals who want to shape their own destiny, upgrade their credentials, and be strategic players in the world of business. The program is also available with emphasis areas such as Business and Organizational Security Management, Decision Support Systems, Environmental Management, Finance, Gerontology, Human Resources Development, Human Resources Management, Information Technology Management, International Business, International Relations, Management and Leadership, Marketing, Media Communications, Procurement and Acquisitions Management or Web Services. MBA courses at Webster University integrate information and theories from various disciplines including accounting, economics, finance, marketing, production operations and strategic management, and provide tools and techniques students will need to problem solve in a wide variety of business situations. Thanks to Webster's multiple locations and online offerings, students who relocate or travel for work do not have to put their master's degree on hold. The master of business administration degree program is available as a traditional classroom and online graduate program, as well as a hybrid program with classroom and online class offerings to accommodate busy schedules.